Mayhems had the most liked content! Could not help my self. haha ill have to take that photo my self. There is modding and there is pride. Each picture is mounted with 5mm thick art gallery card and bevel and then mounted to come from the wall by 2". mayhems Mayhems Tubing and Coolant compatibility guide. Bill has sent over some decent PETG tubing to test so we can add it to the list, once testing is complete we will post results. Mayhems Tubing and Coolant Guide for users. This will aid in choosing the right coolant for the right tubing. It is a very basic guide how ever accurate. All testing is done in house over long periods of time. Tubing can fail for many reasons but failure has scored it a negative mark. Some reason for failure include, Micro fracturing, Cracking, Shrinkage, Drying out and more. 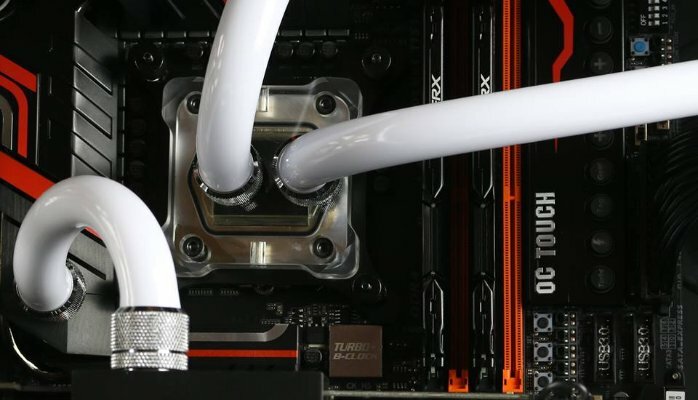 Mayhems Tubing and Coolant compatibility guide. Excellent i hope it all goes well, its always good to see new builds, i get that giddy kid feeling when i see them :). Mayhems Tubing and Coolant Guide for users. lol no ... i Now have the Odriod C1, C2 and XU4 my fav and by far the best is the c2. Yerh mate i have PI Zero, 1,2,3 as well but the odroid is much more powerful (ofc more expensive) but just as fun. You can do this mod to any one of them. We all Love gimmicks but when your gimmicks turn out to be the near perfect cooling solution for a small system such as the Odriod XU4 from http://www.hardkernel.com/ its becomes even more fun. The Odroid XU4 is a 8 core mini PC running 4 cores at 2Ghz and 4 cores at 1.2 Ghz. The onboard active cooling ram up and down like a yoyo and when the system hits its maximum heat load of a whopping 98c the system will then throttle down to 900Mhz. this is annoying when your pushing the limits of the system. With that in mind i decided to water cool the mini PC with the intention of just using what i had on hand and not spending a penny. Now this is fine for me since o own a company and to be as humble as possible i have direct access to lots of broken / tore apart systems and AIO's. Any way after 4 hours worth of thinking and about 2 hours graft i present to you a water cooled Odriod XU4 running now at 38c (on full load, all 8 cores running hard). Im still working on my concept design as we need to do some more adjustments but my final goal will be to get it cool further and also have a better way of reading and controlling the voltages. this is for no other reason but the pleasure of doing it and the fun involved. The coolant inside is a new Nano coolant ive been working on for AIOs to make them much better at cooling... and it seemingly is doing a dammed fine job... Some times you have to take a brake from work and play. Guys you need to start hosting images after part build Sorry for cappy photos how ever cannot be bothered doing them right ... Test Fit for some PC parts ... The pc will be mainly built from parts i have lying around and what i can scrounge for my daughter. as you can see there is a lot of real estate in this case, so plenty of room for modding how ever that's not up to me that's up to my daughter and this is after all her first build. This is my daughter Very first build..... First off i got her the Hex gear R80 to see if she could follow instructions, Took her 2 Hours 20 min to put the case together. how do i add pics !!! Which coolant is right for me? Which coolant is right for me? Which coolant is right for me? When choosing a coolant there are several types you can go for. Below is a very simple guide for you to choose the correct coolant for your needs. High performance, no colour and low cost Mayhems Ultra Pure H20 For normal water cooling systems there simply is no better performing liquid than pure water. Mayhems Ultra Pure H20 is the ultimate water which has been filtered to such a high level there simply is no better branded Ultra-Pure water on the market. For this reason alone if you would like the get the most out of your water cooling system temperature wise opt for this. However you do need to also consider a few other factors including which biocide you would like to use as without it over time UV rays can penetrate into your system creating the perfect harbour for bacteria and algae to grow. High performance, low cost and colour Mayhems Ultra Pure H20 + Dye As explained above you can opt to use Mayhems Ultra Pure H20 to give you the best performing liquid out there but if you would like a colour tint to the water you can simply add Mayhems Dye range to your system. Mayhems dye range is the Number one dye in the water cooling world to use and is recommended by many of the top modders and water cooling builders out there. It has been tested for many years around the world and has gained the ultimate reputation for being the best and the only dye to use. Mayhems XT-1 250ml Concentrate Mayhem XT-1 Coolant is a High Efficiency, Non-Toxic, Low Viscosity coolant based on Ethylene Glycol. Mayhems XT-1 Is a Low Cost very effective concentrate coolant and can be used to make up to 3 Ltrs of coolant for very little out lay. High performance with or with out colour premixed Mayhems X1 Coolants Mayhems X1 Coolants are made from vegetable extract and are the safest and least toxic coolant on the market today. It comes in many colours to suit the needs of everyone. There is no messing around, you just pour the coolant into your systems and that is it. Mayhems X1 includes all the biocides and inhibitors you will need to protect your water cooling system and doesn’t require the user to add anything extra. If you would like to make your own colour Mayhems X1 is fully compatible with all Mayhems Dyes. We do recommend you change your coolant out regularly as over time the coolant will become less effective. Our recommend change out period is every 9 to 12 months. Mayhems Pastel Coolants Mayhems Pastel Coolants are a Nano based coolant that have an outstanding reputation not only for looks but also for performance. This fluid not only stands out from all the other manufacturers of coolants but all so kicks them in the teeth with metal toe capped boots. Mayhems Pastel is a solid looking coolant that comes in many colours and once again like Mayhems other fluids can be mixed or adjusted to suit your colouring needs using Mayhems Dyes. It has all the biocides and inhibitors in the liquid and needs nothing extra adding. Mayhems Pastel is one of the longest lasting coolants out on the market to date and will last over 3 years with no problems ever reported and this actually makes the coolants more economically viable than any other premixed coolant on the market. Speciality photo work and show system coolants. Mayhems Aurora Coolant Mayhems Aurora coolant lays in an untapped market on its own. No other premixed coolant on this earth even comes close to the looks of this coolant. However there is a down side this coolant is not for the normal home user and will not last as long as the aforementioned coolants and was never created for such purposes. The maximum life span for this coolant is 6 months but in some systems may only last 24 hours. Any user wishing to use Mayhems Aurora should first read our FAQ's as this goes into more detail about this product. Sub-zero Coolants Mayhems XT-1 Mayhems XT-1 when mixed correctly and in the right ratio can go down to a staggering -50 making it the perfect coolant for sub-zero liquid cooling. It is the perfect Coolant for anyone using chillier’s in there systems or any sub ambient type of cooling.